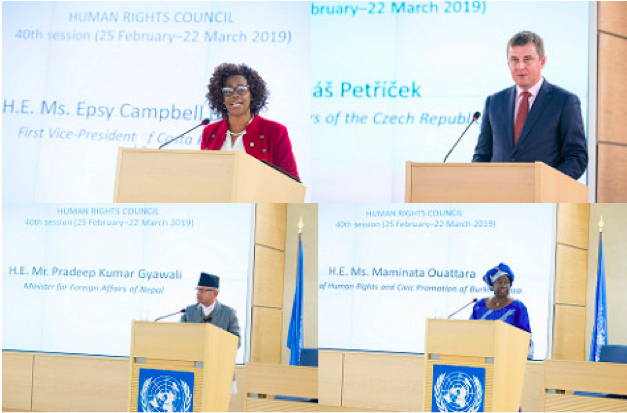 The 40th regular session of the Human Rights Council (HRC40) was held from Monday 25 February to Friday 22 March 2019. 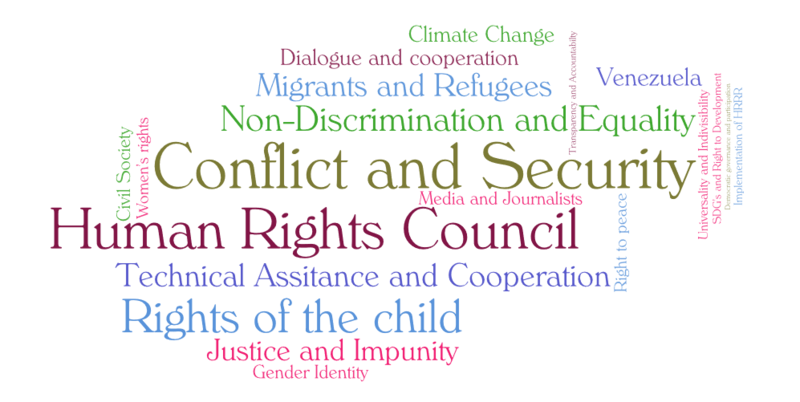 As it is the main annual session of the Council, HRC40 began with a High-Level Segment (HLS). The 2019 HLS included speeches by 97 State and other dignitaries, including: H.E. Béji Caïd Essebi, President of Tunisia; H.E. Josaia Bainimarama, Prime Minister of Fiji; H.E. Epsy Campbell Barr, First Vice-President of Costa Rica; H.E. María Fernanda Espinosa Garcés (Ecuador), President of the GA; and H.E. António Guterres, Secretary-General of the United Nations. In total, three heads of State, 52 ministers, 25 deputy ministers, and 17 other officials addressed HRC40. An analysis of the content and focus of the high-level speeches can be read here. On 6 March, the UN High Commissioner for Human Rights, H.E. Michelle Bachelet, presented her annual report on the global human rights situation. Five panel discussions were held during the session, including two high-level panels. More than 83 reports under the various items of the Council’s agenda were considered. More than 250 side events were organised by States and/or NGOs during the session. HRC40 saw the delivery of a number of important thematic and country-specific joint statements (JSTs), including one by Rwanda (on behalf of 40 States) on human rights and the SDGs, one by the Maldives (on behalf of 14 States) on Council membership, one by the Republic of Korea (on behalf of 56 States) on the impact of new and emerging technologies on human rights, one by Iceland (on behalf of 36 States) on the situation in Saudi Arabia, and one by the UK (on behalf of 30 States) on the rights of LGBTI persons in Chechnya. The Council held an interactive dialogue with Deputy Secretary-General Amina Mohammed, during which she underlined that human rights are at the heart of the 2030 Agenda for Sustainable Development. On the same day the Council also adopted the outcome report on the first intersessional meeting for dialogue and cooperation on human rights and the 2030 Agenda for Sustainable Development. 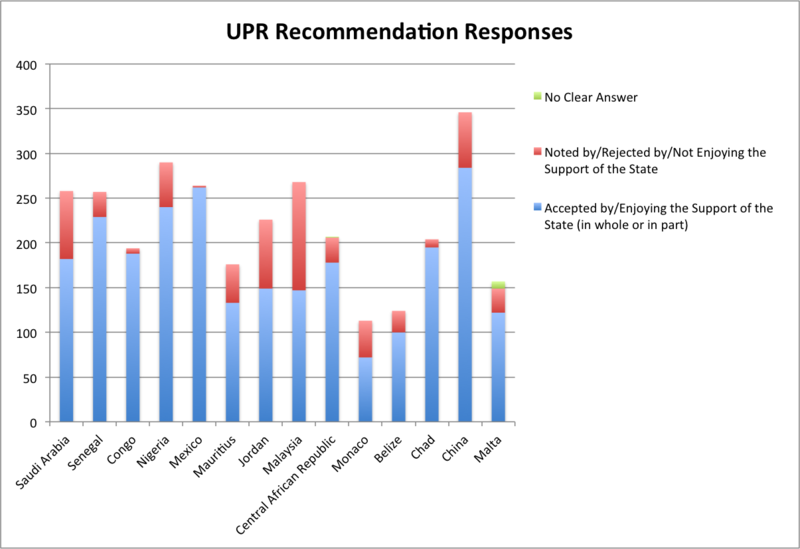 The UPR Working Group outcomes of the following 14 countries were adopted: Saudi Arabia, Senegal, Congo, Nigeria, Mexico, Mauritius, Jordan, Malaysia, Central African Republic, Monaco, Belize, Chad, China, and Malta. Four new Special Procedures mandate-holders were appointed to the following mandates: four members of the Expert Mechanism on the Rights of Indigenous Peoples (one member from Africa, one member from the Russian Federation, Central Asia and Transcaucasia, one member from Central and South America, and the Caribbean, and one member from the Pacific). 29 texts (all resolutions) were considered by the Council. This represents a 31% drop in the number of adopted texts compared to one-year previously. Of the adopted resolutions, 16 were adopted by consensus (55%), and 13 by a recorded vote (45%). Only one written amendment was submitted to these resolutions. This was subsequently withdrawn before voting. 18 of the texts adopted by the Council (62%) had Programme Budget Implications (PBI) and 12 required new appropriations not included in previous Programme Budgets. The total costs of the newly mandated activities amounted to a total of $10’289’700. Opening HRC40, the 13th President of the Council, H.E. Mr. Coly Seck of Senegal, welcomed 97 dignitaries to participate in the three-day High-Level Segment (HLS). In total three heads of State, 52 ministers, 25 deputy ministers and 17 other senior officials addressed the Council. In his opening remarks, President Seck spoke of the importance of civil society engagement with the Council and its mechanisms, and recalled Council resolutions 16/21 and 36/21, which reject any act of intimidation or reprisal against persons or groups that cooperate with the UN (link to the statement). H.E. María Fernanda Espinosa Garcés (Ecuador), President of the GA, noted that ‘the great challenge to overcome [by the Council] is the implementation deficit.’ She also stated that one of the most sensitive human rights challenges facing the world today was inequality. In this regard she noted that the international community needed to build the conditions for a less unequal world if it was to achieve the Sustainable Development Goals, underlining that ‘the SDGs are, in essence, instruments aimed at achieving the full realization of human rights,’ (link to the statement). UN Secretary-General, H.E. António Guterres, made clear that ‘prevention has to be a priority and human rights [are] a template for building resilience and preventing crises.’ He updated States on ‘Human Rights Up Front’ (HRUF). In this regard he noted that HRUF is becoming integrated across the UN system and is boosting the ‘UN’s capacity to spot early signs of crises,’ as well as its capacity to effectively ‘respond to them.’ Notwithstanding, he reminded States that it is they – not the UN secretariat – that has ‘the primary responsibility to uphold and champion human rights.’ The Secretary-General also drew attention to the links between human rights and the 2030 Agenda. He stated that the 2030 Agenda represents both ‘our [shared] contribution to fair globalisation, and the most clear plan at our disposal to realise the rights of all,’ (link to the statement). The High Commissioner for Human Rights, H.E. Michelle Bachelet, drew State’s attention to the fact that ‘human rights-based policies are effective.’ ‘They deliver better outcomes for people,’ she said. ‘They prevent grievances, conflicts, inequalities, and suffering and discrimination of all kinds.’ Ms Bachelet also expressed her admiration for the Council’s record in sounding the ‘early warning’ alarm. However, she reminded States that the Council and the wider UN human rights pillar must now deliver ‘not just early warning, but [also] early action to prevent conflict and human rights violations,’ (link to the statement). The Federal Councilor and Head of the Federal Department of Foreign Affairs of Switzerland, H.E. Ignazio Cassis, identified two dangerous trends: ‘firstly, turning a blind eye to human rights violations or the shrinking of the space for the advancement of these rights, and secondly, talking about human rights in an increasingly generic and abstract way, which would not help younger generations to understand the importance of this issue,’ (link to the statement). A URG analysis of the content of all 97 speeches during the HLS found that certain issues and situations featured particularly prominently. These are summarised in the ‘word cloud’ below. (Read URG’s full analysis of the high-level segment here). Moreover, two high-level panel discussions were convened during the high-level segment on: human rights mainstreaming, with a focus on human rights in the light of multilateralism; and on death penalty with an accent on the right to non-discrimination and right to equality. Ms Bachelet presented her Office’s annual report on the global state of human rights on March 6th. She began by noting rising global inequalities and their impact on the enjoyment of human rights and on the realisation of the 2030 Agenda. Inequality with regard to wealth, access to resources and access to justice, she noted, were major drivers of human rights violations – both civil and political, and economic and social. The violation of these rights in turn creates a ‘race to the bottom,’ eroding all three pillars of the UN system. Yet she also noted that human rights have the potential to present a virtuous, rather than a vicious, cycle. The UN human rights system must be at the centre of that circle. By providing technical assistance and capacity building where needed, OHCHR helps the synergies between civil and political, and economic and social rights, to be fully realised; thereby reducing inequalities, promoting sustainable development, and supporting peace and security. The High Commissioner also drew the Council’s attention to serious human rights violations on the ground. In particular, she raised the plight of human rights defenders and the reprisals they face. Regarding Saudi Arabia, Ms Bachelet raised the plight of detained women’s rights activists, who have found themselves persecuted even though the reforms they campaigned for were in-the-end accepted. More broadly, the threat of physical and sexual violence and the public shaming of women and their families was highlighted as an urgent matter for discussion by UN human rights mechanisms. While noting China’s economic development, raising millions out of poverty, the High Commissioner voiced her concern over enforced disappearances, arbitrary detentions and the internment of minorities in Xinjiang province. 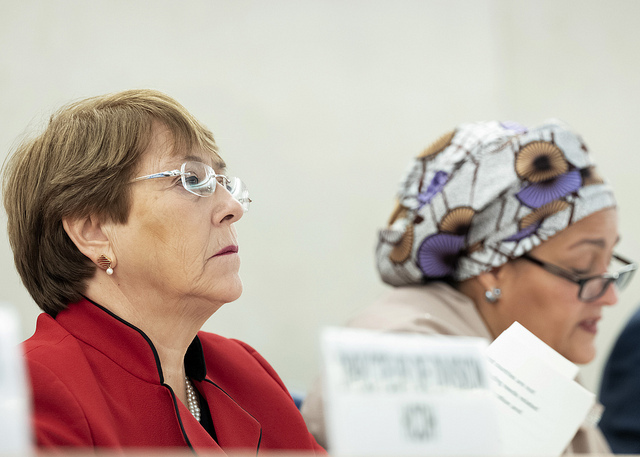 On migration, Bachelet voiced her hope that the adoption of the Global Compact on Migration in December in Marrakesh, could mitigate the worst inequalities that lead to wholesale violations of human rights and, ultimately, to large-scale population movements. Regarding the rights of migrants in receiving countries, the High Commissioner expressed concern over the US Migrant Protection Protocol being implemented at the country’s southern border, as well as over practices of Australia on the detention islands of Manus and Nauru. Overall, the High Commissioner raised 32 country situations in her update to the Council. She also focused on the thematic issues of inequality, human rights defenders with an emphasis on women, and human rights in relation to peace and security. The annual report of her Office can be found here and the official transcript of Ms Bachelet’s speech here. (Commemoration of the International Day for the Elimination of Racial Discrimination). 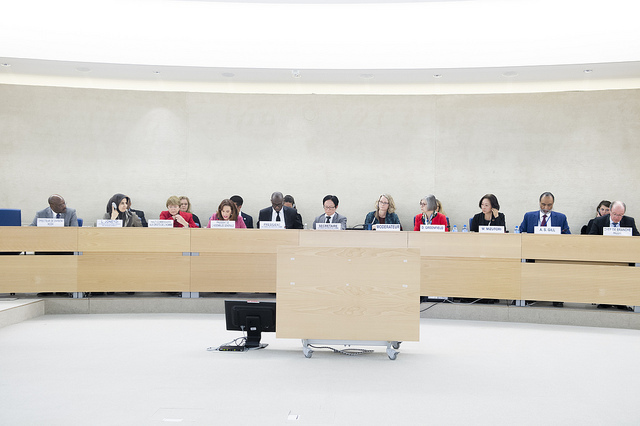 The Trust Fund for the participation of LDCs and SIDS in the work of the Council (set up in 2012) funded the participation of seven (five female and two male) government officials at HRC40. The delegates came from Bangladesh, Lesotho, Myanmar, Republic of the Marshall Islands, Samoa, Timor Leste, and Trinidad and Tobago. For all of them, it was the first time they had participated in a Council session. It has become customary for the beneficiaries of the Trust Fund to deliver a joint statement during item 10. This session Marissa Toomata, delegate from Samoa, delivered the statement on behalf of all the beneficiaries. The full text can be found here. The deadline for applications to receive support from the Trust Fund in order to attend HRC41 (June-July 2019) is 1 April 2019. More information can be found here. 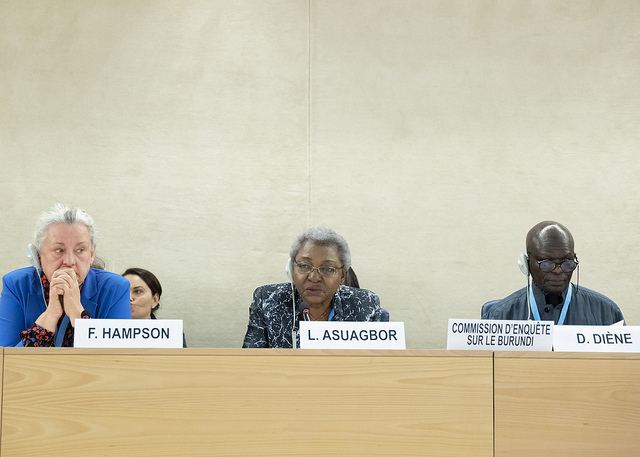 During an interactive dialogue, the Commission on Human Rights in South Sudan (CoHR) presented its annual report. The report provides an overview of the human rights situation in South Sudan and gives an update on critical developments and incidents during 2018, including with regard to transitional justice. Yasmin Sooka, Chair of the Commission, stated that during its investigations the Commission identified 23 individuals bearing command and superior responsibility for serious crimes under international law. She acknowledged improvements in the security situation following the signing of the revitalised peace agreement, notwithstanding the continued volatile situation in the Equatorias. Ms Sooka also highlighted the profound impact of the conflict on women and girls, who have suffered serious human rights violations at the hands of both Government and Opposition forces. She further stated that the climate of impunity in the country has led to the systematic use of sexual violence as a tactic of warfare, with 25% of all reported cases involving children. Andrew Clapham, member of the Commission, expressed concern about the number of executions and called on the Government to adopt a moratorium on all executions. In his intervention, Barney Afako voiced the Commission’s concern about the lack of progress in the area of transitional justice, including with regard to the establishment of the Hybrid Court, the Commission of Truth, Reconciliation and Healing, and the Compensation and Repatriation Authority. South Sudan, speaking as the concerned country, said they were surprised, after hearing the Commissioners acknowledge that the situation in the country had improved since the signing of the revitalised peace agreement, had nonetheless then preceded to talk about gang rapes and killings. South Sudan highlighted the success of the permanent ceasefire signed in July 2017. The concerned country further highlighted the creation of mechanisms for the implementation of the peace agreement, and denied knowledge of the catalogue of sexual offences contained in the report. At HRC40, the Commission of Inquiry on the Syrian Arabic Republic (COI Syria) presented its latest report and held an interactive dialogue with States and civil society. Mr Pinheiro, Chair of the CoI, warned that the reduction in fighting since Government forces recaptured rebel territory in 2018, does not mean that the conflict has come to an end. Indeed, violations of international human rights and international humanitarian law remain commonplace. He highlighted the city of Idlib as an area of particular concern, and the large numbers of refugees and internally displaced persons as pressing human rights and humanitarian issues. Mr. Pinheiro also reminded States that armed conflict is not the only threat faced by the Syrian population; they also face a range of other serious and systematic human rights violations including discrimination, arbitrary arrest and detention, and extrajudicial killing. In this context he highlighted the publication of the COI’s policy paper on ‘death notifications’ and underscored the right of families to know what has happened to their relatives. The Syrian Arab Republic, speaking as the concerned country, noted that it did not recognise the mandate of the COI and dismissed its report, claiming, inter alia, that the COI had ignored the Government’s efforts to counter terrorism. Syria concluded by asking the Council not to renew the mandate of the COI. The Commission of Inquiry on Burundi (COI Burundi) delivered an oral briefing on the human rights situation in the country. The Chair, Mr Doudou Diène, underlined the continued importance of the COI, as it was currently the only international mechanism mandated to investigate the human rights situation in Burundi, which remains grave. Its work is even more relevant in the context of the upcoming 2020 elections. According to the COI, as the elections approach, the authorities are cracking down on the Opposition, while voters are being routinely harassed. Mr Diène also expressed the Commission’s regret at the continued policy of non-cooperation by the Government. Ms. Françoise Hampson, Member of the Commission, expressed the Commission’s deep regret at the closure of the OHCHR Office in February this year, and their worry at the continuing shrinking of civic space in the country. She also noted that perpetrators presumed to be responsible for serious crimes under international law had still not been prosecuted and remained in key positions of authority. Burundi, speaking as the concerned country, rejected the report. Burundi further claimed that the apocalyptic predictions of the 2020 elections were misplaced, and asked the international community to refrain from all actions that would undermine this important national poll. The Commission presented its initial report during HRC40. Mr Santiago Canton, Chair of the Commission, regretted that the Israeli Government had not cooperated with the Commission and had refused it entry into the OPT. During the dialogue the Commission highlighted it key findings, including that the IDF had committed serious violations of human rights and international humanitarian law. The Commission also called on the de facto authorities in Gaza to refrain from using incendiary kites and balloons. Additionally, the it called on the international community to take stronger action to stop the loss of life in the OPT. Israel did not respond to the Commission’s findings as the country concerned. The State of Palestine thanked the Commission for its work and welcomed the report. They also called on the High Commissioner to refer the documented cases to international justice bodies in order to provide remedy and redress for the victims. The Council adopted the UPR outcome reports of Saudi Arabia, Senegal, Congo, Nigeria, Mexico, Mauritius, Jordan, Malaysia, Central African Republic, Monaco, Belize, Chad, China, and Malta. A total of 3084 recommendations were made to these 14 States, out of which 2481 were accepted in whole or in part, and 594 were noted or rejected. During the item 6 general debate, Pakistan, on behalf of the OIC, highlighted the positive effects of the UPR mechanism on-the-ground. In many cases the UPR has led to countries voluntarily amending their domestic laws and practices in line with international human rights norms. In a statement on behalf of the EU, Romania said that in order to help the UPR be as effective as possible it is important that recommendations are based on objective and reliable information. In this regard, the EU highlighted the vital role of civil society, and called on all States to enable and encourage the legitimate participation of NGOs throughout the UPR process. The EU concluded its statement by reaffirming its commitment to defending civil society space and preventing reprisals. In a very positive development for the effectiveness and relevance of the Council, a number of States (e.g. the Czech Republic and Mongolia) used the general debate to update the Council on the progress they had made at national-level in implementing accepted recommendations from earlier cycles of the UPR. The Marshall Islands, speaking on behalf of the beneficiary delegates of the LDCs/SIDS Trust Fund, highlighted the serious challenges faced by LDCs and SIDS in the context of implementing UN recommendations and reporting back to the various UN human rights mechanisms. The Marshall Islands concluded by calling for universal participation at the Council, as called for in resolution 34/40. 20 Special Procedures (14 thematic, six country-specific) presented their annual reports at HRC40 (all of which are available here). During 14 interactive dialogues (six ‘clustered’ and eight individual), 121 States delivered 461 statements (either individually or jointly), of which 18% were from the African Group, 29% from APG, 14% from EEG, 14% from GRULAC, 26% from WEOG, and 1% from other countries (namely the State of Palestine, the Holy See and the Sovereign Order of Malta). To inform the appointments, the Consultative Group, made up of representatives of Azerbaijan, Ecuador, Ethiopia, Israel, and Singapore, scrutinised around 33 individual applications for four vacancies. The Consultative Group sent its recommendations to the President of the Council on 25 January 2019. Following ‘broad consultations, in particular through the regional coordinators,’ ‘to ensure the endorsement of [his] proposed candidates,’ the President followed the recommendations of the Consultative Group in all four cases. His proposals were sent to the Council via letter on 11 February. As of today, there are 56 Special Procedures mandates (44 thematic, 12 country-specific), and 80 mandate-holders. The Philippines, speaking on behalf of ASEAN, reminded the Council that the code of conduct and the manual of operation provided the fundamental guidelines for the work of Special Procedures. They noted that comprehensive and inclusive discussions might be a good initial step to assess areas of overlap and duplication between mandates, and could contribute to Council efficiency efforts. Brazil, speaking on behalf of a Group of States, encouraged Special Procedures to focus on the identification of good practices, on achievements and impact, and on providing technical assistance. They also called on States to engage in an open and constructive manner with mandate-holders. During the general debate under item 10, Angola, speaking on behalf of the African Group, said that if technical cooperation is to be efficient, it should reflect the indivisibility of all rights and take national development priorities into account. In this sense, the 2030 Agenda offers a potential entry point. The Maldives, speaking on behalf of a new Contact Group for Council membership, emphasised the importance of having an inclusive and diverse Council membership – i.e. reflecting the diversity of UN membership as a whole. In order to promote this ideal, the new Contact Group would engage with Small States, especially those that have not yet had the chance to stand for election, to help strengthen their participation in the Council. The 40th session of the Council concluded with the adoption of 29 texts (all resolutions). 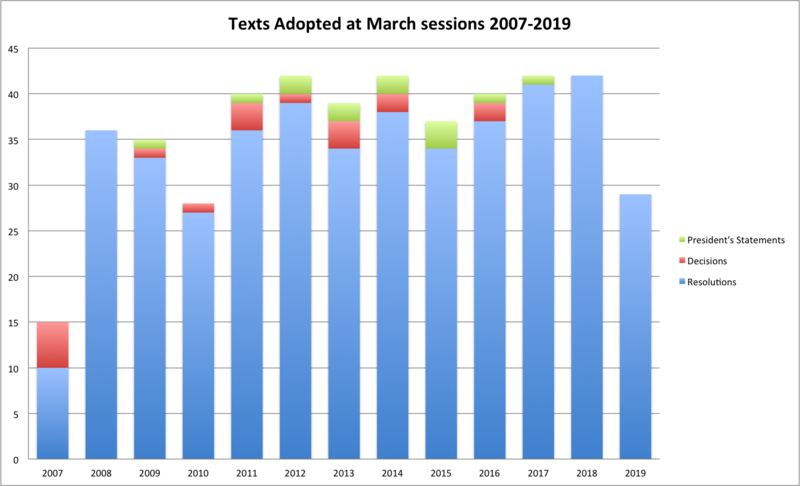 This is 13 resolutions less than the number of texts (42) adopted at the 37th session in March 2018 or a reduction of 31%. This significant reduction reflects the continued success of Council efficiency efforts over the past four years. Around 45% of tabled resolutions at HRC40 were adopted by a recorded vote. 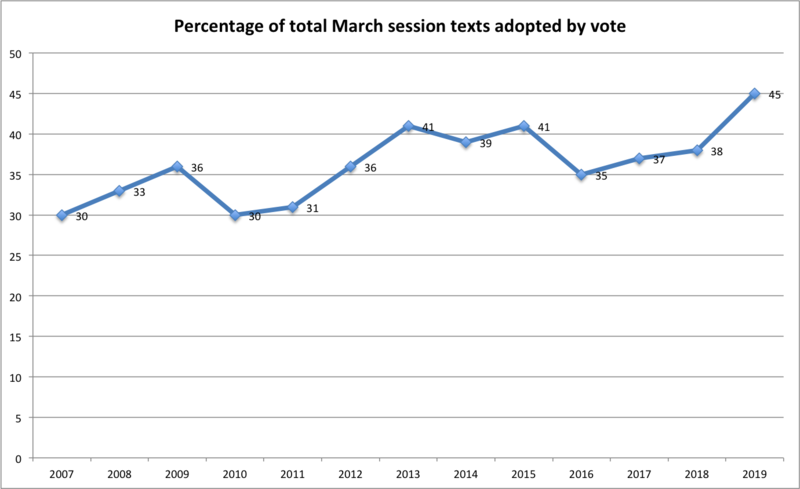 This is an increase of 38% compared with the previous March session. 14 (48%) of the texts adopted by the Council were thematic in nature, while 15 (52%) dealt with country-specific situations. Of the latter texts, three addressed human rights violations under agenda item 2, five under item 4, four under item 7, and three sought to protect human rights through technical assistance and capacity building (under item 10). 18 of the texts adopted by the Council (62%) had Programme Budget Implications (PBI), requiring appropriations of $10’289’700 not previously covered by the UN regular budget. 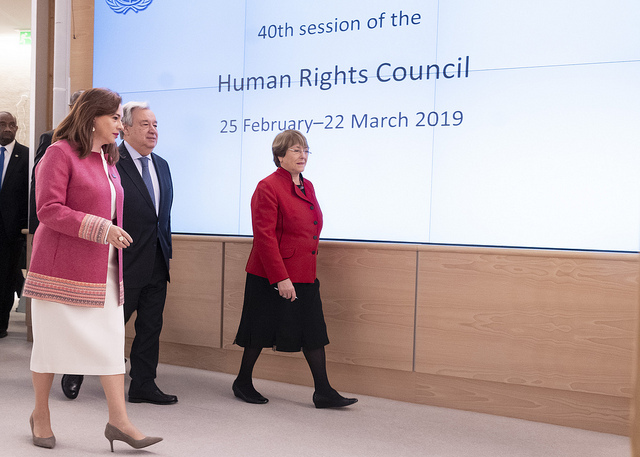 In a further sign of a strong upward trend in the work and output of the Human Rights Council, HRC40 was – like the previous two regular meetings of the UN’s apex human rights body (June and September 2018) – highly successful. The principal measure of that success is, of course, provided by the strength of resolutions adopted, the scope of joint statements delivered, and the quality of debates and dialogues held. However, these tangible outputs and outcomes are built upon something rather more abstract: the building of trust between delegations, especially delegations from different regional and political groups, and the expansion of space for meaningful dialogue and cooperation (between States and also with civil society). Unfortunately, during HRC40 there were worrying signs that a degree of complacency may be setting in (i.e. that the current positive trends cannot be taken for granted), which risks undermining trust and, ultimately, may presage a reversal in the Council’s fortunes. In a further sign that Western States (in cooperation with countries of the global South) are taking steps to move beyond old, stale arguments about the relationship between human rights and development (i.e. arguments that have tended to characterise discussions over the ‘right to development’), and are – instead – seeking to forge new links between the UN’s human rights and development pillars, HRC40 saw Norway present a resolution on ‘Recognising the contribution of environmental human rights defenders (EHRDs) to the enjoyment of human rights, environmental protection and sustainable development.’ These individuals, often working at great personal risk, seek to assert their human rights in order to defend the natural environment. By doing so, they also stand at the front-line of global efforts to secure sustainable development/the achievement of the SDGs ‘leaving no one behind,’ and to halt climate change. The fact that Norway’s strong draft resolution – on a subject matter that has often been subjected to amendment and voting in the recent past – was eventually adopted by consensus is a clear vindication of Norway’s approach, and of wider efforts to show that human rights and sustainable development (including environmental sustainability) are complementary and mutually reinforcing. Regarding those wider efforts, HRC40 also saw the adoption of the outcome report of the Council’s first inter-sessional meeting for dialogue and cooperation on human rights and the 2030 Agenda (which will now be transmitted to the High-Level Political Forum (HLPF) in New York); an important speech by, and interactive dialogue with, Deputy Secretary-General Amina Mohammed, during which she underlined that human rights lie at the heart of the 2030 Agenda for Sustainable Development; and a number of important speeches by States (e.g. Rwanda on behalf of the core group on human rights and the SDGs). Importantly, in a nod towards recent youth strikes against climate change, the final resolution on EHRDs also calls on States to provide a safe and empowering context for initiatives by children/young people to assert their rights and protect the environment. Another thematic resolution that was the subject of considerable focus and interest at HRC40 was Mexico’s traditional resolution (mandate renewal) on the protection of human rights while countering terrorism. The interest on this occasion was generated not so much by the text itself but by the fact that Mexico had initially decided to present the resolution alongside Egypt. This continued a process of cooperation between the two delegations, designed to merge Mexico’s initiative with Egypt’s more recent initiative on a similar subject: the effects of terrorism on human rights. At HRC37 last March (as well as at GA73 in New York), Mexico and Egypt had succeeded in combining their initiatives. However, on those occasions, the resolutions were substantive texts, whereas at HRC40 the draft resolution aimed to renew the mandate of the Special Rapporteur on protecting human rights while countering terrorism. Mexico’s decision to work with Egypt on the mandate engendered fierce opposition from civil society, and from Western and some Latin American States. These groups argued that any changes to the mandate to integrate issues such as the ‘ethics of terrorism’ would risk the future credibility and effectiveness of the mandate. In the end, Mexico decided to table the mandate-renewal on its own – though in the hope it can continue to work with Egypt on future substantive resolutions. If that does not happen, the risks are clear: the Council may once again be faced with competing resolutions on the same broad subject matter, and – worse – might eventually be faced with a text seeking to establish a new Special Procedures mandate on the effects of terrorism. A third thematic resolution of note was a new South African initiative on the elimination of discrimination against women and girls in sport. The resolution covered a number of important topical – yet also sensitive – issues, including in relation to sexual and reproductive rights. South African leadership on such issues is both significant and welcome. Notwithstanding often rather difficult negotiations on the text, pitting South Africa against the OIC, the Arab Group, and Russia, the resolution was eventually adopted by consensus. It is the first text adopted by the Council that includes language on bodily autonomy. Under paragraph 3 of GA resolution 60/251 – which sets out the Council’s overall mandate and powers – member States ‘should address situations of violations of human rights, including gross and systematic violations, and make recommendations thereon.’ The next paragraph then states that, in fulfilling this task (as well as others assigned to it), the Council’s work shall be guided by certain key principles including: universality, impartiality, objectivity and non-selectivity. Taken together, these paragraphs mean States should judge situations of violations objectively, and where they decide that the seriousness of alleged violations warrants the international community’s attention, the situation(s) should be brought to the Council’s attention. Unfortunately, in the past the Council has failed to live up to these principles. 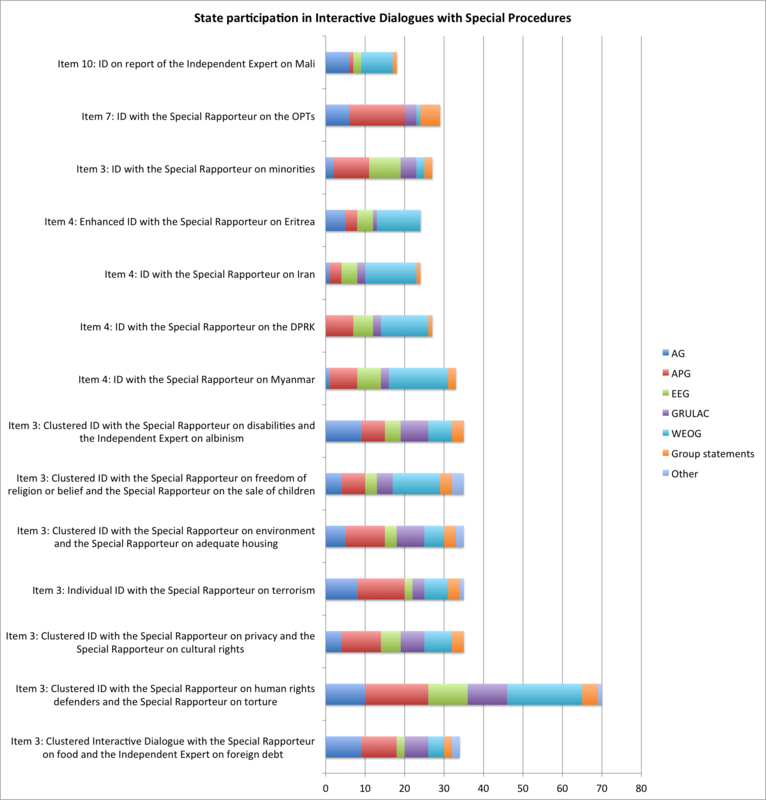 The geographic reach of its attention (as per its mandate under paragraph 3, GA resolution 60/251) is been remarkably narrow – covering only 15 or so situations (under item 4), mainly in Africa and the Middle East. Moreover, partly because only a small number of Western States (mainly US, UK/EU) have been inclined to bring situations to the Council’s attention, the body’s relatively narrow gaze has been criticised as selective and politicised. Since HRC38, that has started to change. Key to understanding that change is that although the US has departed, other States – both those that have traditionally brought situations to the Council’s attention (e.g. UK), and those that have not tended to do so (e.g. certain Latin American States, Iceland) – have stepped forward. The UK, for example, has continued to lead on situations such as Sri Lanka (in cooperation with Sri Lanka), but has also expanded its engagement to cover the situation in Iran (alongside Sweden). At HRC40, the UK also delivered a joint statement (on behalf of more than 30 States) on the situation of LGBTI persons in Chechnya. At the same time, continuing the leadership they demonstrated last year by bringing the situation in Venezuela to the Council’s attention, at HRC40 the ‘Lima Group’ of Latin American States plus Canada tabled a draft resolution on the situation in Nicaragua. This was adopted by a vote with 23 in favour, 3 against and 21 abstaining. The fact that Latin American countries themselves are bringing worrying human rights situations from their own region to the Council’s attention is highly significant. Last but not least, Iceland, which last year took over the seat left vacant by the US, continued its strong and principled drive to ensure the Council honours its mandate to judge situations based on merit (i.e. impartially, objectively and non-selectively) rather than according to global power politics. In this spirit, at HRC40 Iceland delivered (on behalf of 36 States) a joint statement on the situation in Saudi Arabia, calling inter alia for the release of detained women human rights defenders, and for the Saudi authorities to cooperate with the Special Rapporteur on extrajudicial executions in her investigation into the killing of journalist Jamal Khashoggi. A final interesting point relating to the Council’s work to address situations of violations is that HRC40 also saw the US unofficially engage with this work – nine months after they de jure left the Council. During the session, the US organised two (unofficial – i.e. the invitations did not mention the Council) side events: one on ‘Protecting Fundamental Freedoms in Xinjiang,’ and one on the situation in Venezuela. While this does not in any way suggest an imminent American return, it probably does reflect a recognition, on the part of the US, of the Council’s important role in addressing situations of concern (especially when the Security Council is hamstrung by vetoes) and of the positive recent trajectory of the body and its members. Despite these positive trends at the Council, HRC40 also revealed a number of dark clouds on the horizon – warning signs that, if left unaddressed, may presage a future breakdown in trust amongst delegations and a decline in the Council’s fortunes. First amongst those warning signs was the haphazard manner in which the EU dealt with the long-term challenge of ‘item 7’ – i.e. how the Council should address human rights violations by Israel in the Occupied Palestinian Territories (OPT). At HRC40, the EU and the Palestinian delegation took the welcome step of beginning discussions on how to move beyond frustrating procedural arguments over agenda items, and actually address violations in the OPT in a meaningful way. The outcome of those talks was an informal understanding under which the Palestinian delegation would move one resolution from item 7 to item 2, in return for a ‘fairer hearing’ of that resolution by the EU/WEOG. If successful, it was hoped this first step may result in further progress at the session and in the future: such as the merging of some traditional item 7 texts, and the continued movement of resolutions from item 7 to item 2. Unfortunately, the execution of the informal deal was badly handled. For its part, the EU was unhappy at the Palestinian delegation’s choice of resolution to move: the draft text on accountability for violations in the OPT (i.e. one of the more ‘difficult’ item 7 texts). For their part, Palestine and the wider OIC were deeply disappointed when a number of EU members of the Council (Austria, Hungary, Poland), acting (apparently) under Israeli pressure, in any case voted against the resolution. Many of the positive steps taken by the Council at HRC39 and HRC40 (e.g. the joint resolution on Myanmar at HRC39, coordination over the freedom of religion and religious intolerance initiatives at HRC40) have been built on a new, strong, cooperative relationship between the EU and the OIC. The EU’s missteps at HRC40 over item 7 put that relationship at risk. Moreover, the disagreement over item 7 fits into a wider emerging narrative, amongst developing countries (especially members of the LMG) that while ‘they’ are reaching across the aisle to engage with WEOG States on issues of importance to the West, WEOG States are failing to reciprocate. For example, it was repeatedly noted during the last days of HRC40 that WEOG members of the Council have made little or no effort to engage with, and be flexible towards, initiatives of high importance to developing countries, such as Cuba’s resolution on the impacts of foreign debt (adopted by a vote: 27-14-6) and the African Group’s resolution on the repatriation of illicit funds (31-2-14). 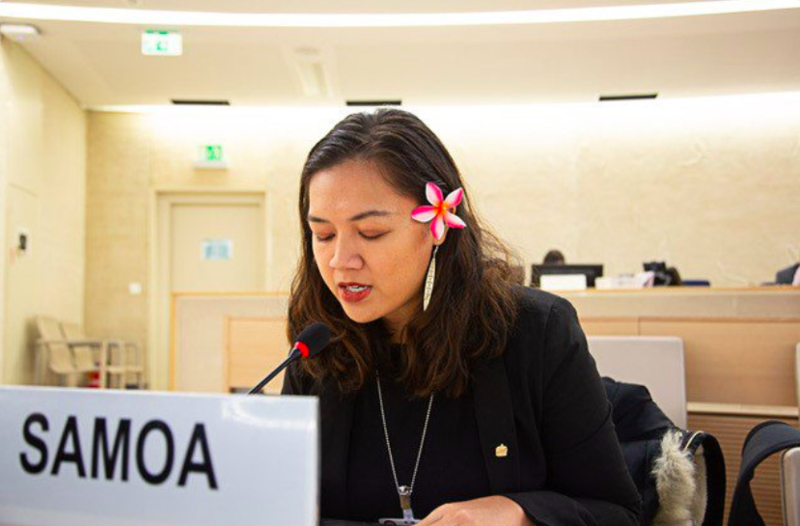 Two final trends noticeable at HRC40 were the growing participation and influence of Small States, and the launch, by the Council President, of a process to consult States on preparations for the GA’s 2021-2026 review of the Council. On the first point, at HRC40 the Bahamas and Fiji took their seats on the Council for the first time. They are only the third and fourth Small Island Developing States (SIDS) to become Council members. These countries, together with other Small States such as Iceland, have played a key part in the good results seen at HRC38, HRC39 and HRC40. On the second point, during HRC40, Switzerland and the URG organised a side event to launch a new report: ‘Vision 2021’. The report provides background on the GA’s next review of the Council’s status, expected to begin from 2021, and offers ideas as to how the Council might usefully contribute to that review. Shortly afterwards, the President of the Council, Coly Sek, circulated a note verbale to missions and NGOs convening a first open consultation on the 2021-2026 review and on ‘Geneva’s’ role therein. Feature photo: Official visit of the Secretary-General, 25 February 2019 by UN Photo/ Jean Marc Ferré. H.E. Mr. Tomáš Petříček, Minister for Foreign Affairs, Czech Republic, addresses the Opening of the 40th session of the Human Rights Council, Palais des Nations. 25 February 2019. UN Photo by Antoine Tardy.